Greta and Steve’s wedding provided such an emotional moment that made it difficult for me to keep taking photographs. Before her wedding began, Greta informed me that she would be wearing her mother’s wedding dress and her mom had no idea whatsoever. Needless to say, you probably know exactly what type of photograph I wanted to capture……..mom’s reaction…..without question. 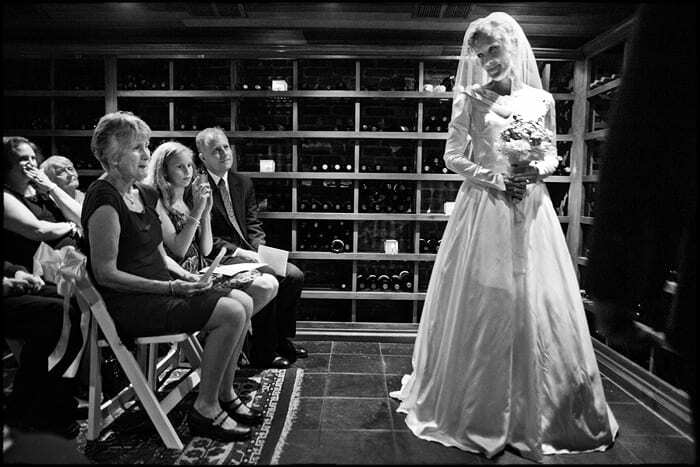 This wedding presented all of the usual challenges for a wine cellar wedding in the basement of the Clifton Inn…..extremely low light, bright hot spots, small spaces, and most of all a difficult decision of where I wanted to be when capturing this moment that would almost certainly make for one of the most heartfelt images of the evening. When Greta walked in, I took a few very quick photos of her and then immediately found her mom through my lens. Her mom didn’t see the dress at first……she was staring at Greta’s eyes…..understandably so. As Greta passed me, I heard a gasp……..and I knew……her mom had just recognized the dress that she had worn so long ago. There were only 30 guests in attendance, so my sprint down the isle took me three steps and a split second………”click”. One exposure, one moment in time. Rob Garland is the owner of Rob Garland Photographers, a company which specializes in photojournalism and fine art printing. Rob prides himself on a classic, intuitive, heartfelt documentation with the utmost in visual integrity. He has documented many destination weddings throughout the U.S. and abroad as well as Charlottesville weddings at many of our outstanding local venues. Rob loves imagery that fails to go in and out of style and personal touches that make each wedding unique.